Seems like just about no one can pronounce his name. But more and more people want to know about him. Four months ago, Pete Buttigieg, the 37-year-old mayor of South Bend, Indiana, was a flat line on the political landscape outside of, well, Indiana. But after announcing a presidential exploratory committee in mid-January, he’s everywhere: CNN. Vox. Stephen Colbert. Bill Maher. New York Times. Washington Post. Fox. And CNN again. 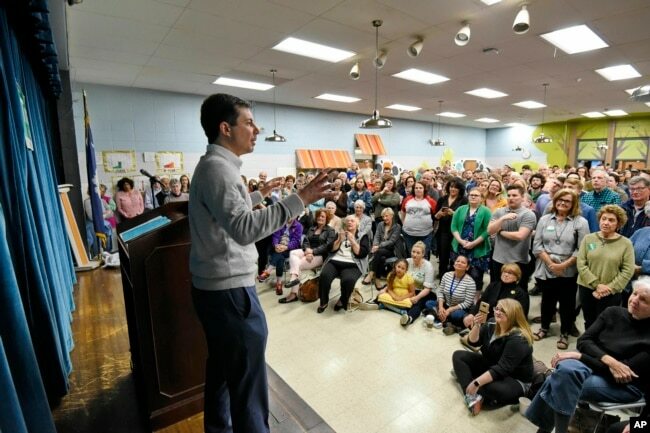 While lacking in stature among a Democratic political field strewn with U.S. senators, House members, a former governor, and likely, a former vice president, Buttigieg boasts an impressive resume. The son of an immigrant from Malta, Buttigieg attended Harvard College around the same time as Facebook founder and fellow millennial Mark Zuckerberg. He received a prestigious Rhodes Scholarship to Oxford University, spent seven months in Afghanistan in the U.S. Navy Reserves as an intelligence analyst and driver and worked as a consultant for McKinsey & Company. Reportedly he speaks seven languages, some of them fluently, including Spanish and Norwegian. And while he would be the first openly gay candidate for president, recent polling shows that 70 percent of American voters said that wasn’t really an issue for them in deciding who to lead the country. That has led Buttigieg to the No. 3 slot in two recent polls — behind former Vice President Joe Biden and Vermont Senator Bernie Sanders — that ask people whom they would vote for if the election were held today. A relatively inexperienced newcomer to national politics, he’s bubbled up among a very large field of very experienced candidates very quickly. And before formally announcing his candidacy — although Buttigieg has tweeted followers to mark their calendars for April 14 — Buttigieg has raised $7 million so far and assured himself a spot in the Democratic presidential debates that begin in June. By comparison, Sanders raised $18.2 million over the first six weeks of his campaigning while Sen. Kamala Harris of California raised $12 million. “Pete Buttigieg and his husband [Chasten Glezman Buttigieg] actually have both been able to leverage Twitter and all sorts of social media to help them separate themselves from the rest of this slate of candidates, which is a lot of older folks, a lot of senators, and elected officials who have been around for a little while,” said Leah Askarinam, reporter and political analyst for Inside Elections. In the checkboxes of qualifications for presidential candidate, Buttigieg seems to light up the words “millennial,” “war in Afghanistan,” “Harvard” and “gay.” Younger voters seem to delight in “Mayor Pete’s” candidacy as “looking more like me” than elder competitors. He talks about climate change and abolishing the electoral college. A devout Catholic, Buttigieg makes going to church sound philosophical and cool rather than predatory. He trends well with older voters, as well, His youthful exuberance and firm grasp of the issues is appealing not only to younger voters, but older Americans, too, who view him as a fresh breath of air or a brilliant grandson. But his lack of experience running anything more than a small Midwestern city is a persistent issue during interviews. Wildly popular Stephen Colbert of “The Late Show with Stephen Colbert,” which garners 3.1 million viewers per episode seemed a bit skeptical about a young newcomer becoming leader of the free world. Talk-show host Bill Maher pushed Buttigieg about how well he could straddle issues that independents and undecided voters could get behind, saying Buttigieg’s keyword issues to young voters — like transgender bathrooms — are off-putting or irrelevant to older voters. While the nation last year shifted from Baby Boomers being the largest voting block to Millennials taking that weight, the transition for dominance has not been complete: Despite increased voter turnout among Millennials in the 2018 midterm elections, more Boomers go to the polls than Millennials. Buttigieg’s signature response is that unity will bring more voters back to the center, rather than the political polarization the country seems trapped in now. The coastal and metropolitan Democratic party can seem condescending to Midwesterners on the fence over national direction, he said, and that needs to change. “Look, if a wealthy, coastal, liberal professional goes up to a guy pumping gas in South Bend, maybe wearing one of those [Make America Great Again] red hats and says, ‘You know, you’re voting against your economic interests.’ You know what that guy is gonna say? He’s gonna say, ‘So are you.’” he told Maher. 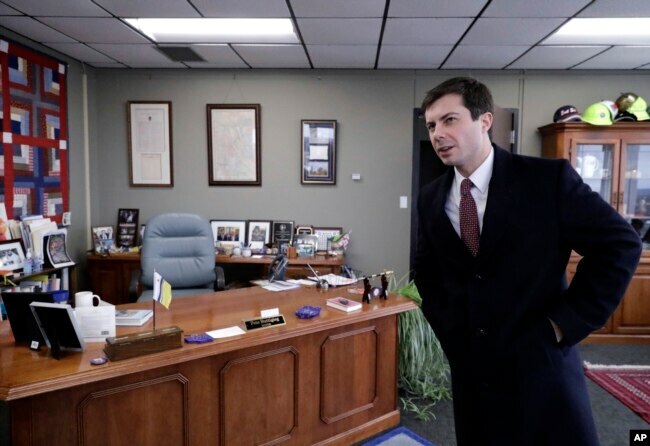 As his popularity and appeal surge from a post-industrialized city in the Midwest, as he typically describes South Bend, the question is often asked if Buttigieg has the wherewithal to upset Biden or Sanders in the Democratic primaries or unseat a Republican president in the general election. Buttigieg (whose name is pronounced boot-edge-edge) lost his bid for Indiana state treasurer in 2010. “I got clobbered. I got my head handed to me,” he chuckled to David Axelrod on Axelrod’s University of Chicago Institute of Politics podcast. Using failure as the best lesson, he said, he ran and won the mayor’s office in South Bend. And now, improbably, Buttigieg has his eyes set on the biggest political prize of all. “But that’s very different than actually winning the nomination, because there are real risks to nominating him for president. And I think that’s obvious to Democrats,” Sabato added.